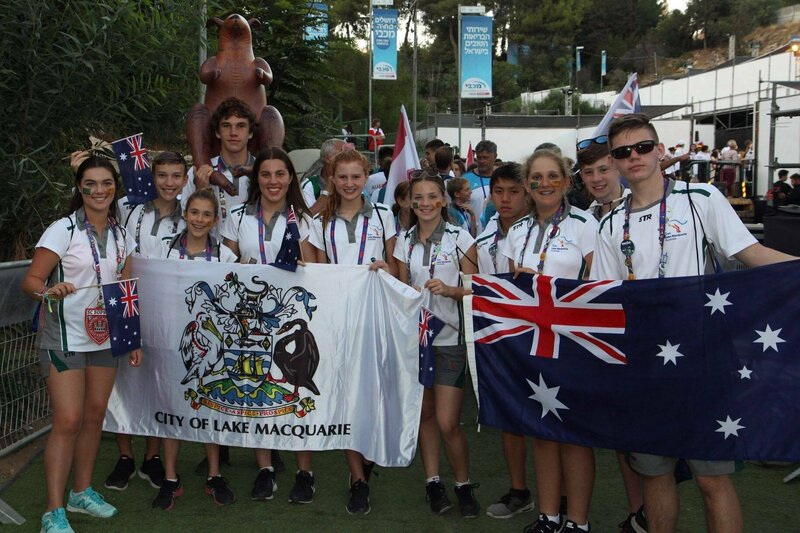 The first members of Team Lake Mac arrived home on Sunday following an unforgettable experience at the Jerusalem-held International Children’s Games that was both rich in culture and sporting competition. The athletes all competed to the very best of their abilities and were rewarded with many personal best performances being recorded among excellent results. Team Lake Mac tennis members Millie Warham and Erica Wattus performed well in their four round matches and played to quarter finals in the doubles competition. Athlete Travis Petersen ranked fifth in the 5kg Shot Put, while both Jemma Pollard and Bryce Webber competed through to the semi final in the 100m sprint. The pair also ran in the consolation final of the 400m. Ben and Jasmine Roberts ran against strong competition but performed to their best ability on the track. Swimmer Emily Dobbins achieved sixth and eighth places in the finals of the 100m and 200m backstroke. Dillon Siv, Caleb Baker and Skye Southam all achieved personal best times and gained invaluable experience in international competition.